For many Mac users, viewing and editing PDFs on a Mac means going to Apple’s built-in Preview application. After all, it’s typically the default on a Mac, set to open the moment you double-click a PDF file. But there are a lot of things that Preview leaves out. For example, it’s not the easiest way to add objects into a PDF file or edit them once they’re there. Yes, you heard right. Long one of the most popular PDF creation software tools for the PC, Foxit PhantomPDF has made its debut for the Mac platform. PhantomPDF Mac brings the things users love most about PhantomPDF to the Mac OS, especially the ability to add and edit text and images. Let’s look at how you can edit a PDF with PhantomPDF Mac. Need to add a paragraph, delete a sentence or even change text on a PDF page? PhantomPDF Mac lets you do all that. Here’s how. Click Edit in the Common Tools toolbar to open the Edit toolbar. Select Add Text in the Edit toolbar. Click on the specific page you want to input the text and type new text. In the Format panel, choose the font and paragraph formats as desired. 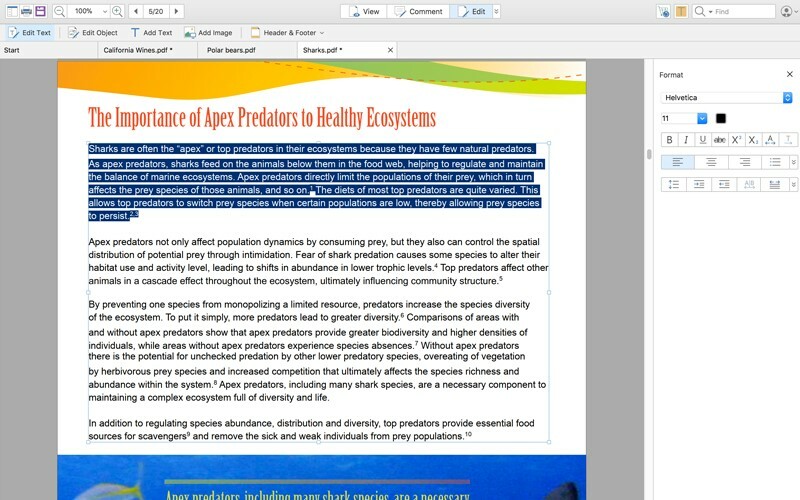 With Foxit PhantomPDF Mac, you can either edit text in a paragraph like Microsoft Office Word or edit text as an independent object. Select Edit Text in the Edit toolbar. Select Edit Object in the Edit toolbar. Select the text object you want to edit, and move, resize, or rotate it as desired. For more information about what you can do with objects, check the user manual section called Move, Resize, Rotate Objects. Double-click the text you want to edit, and then add, delete text, or change font formats for the selected text. 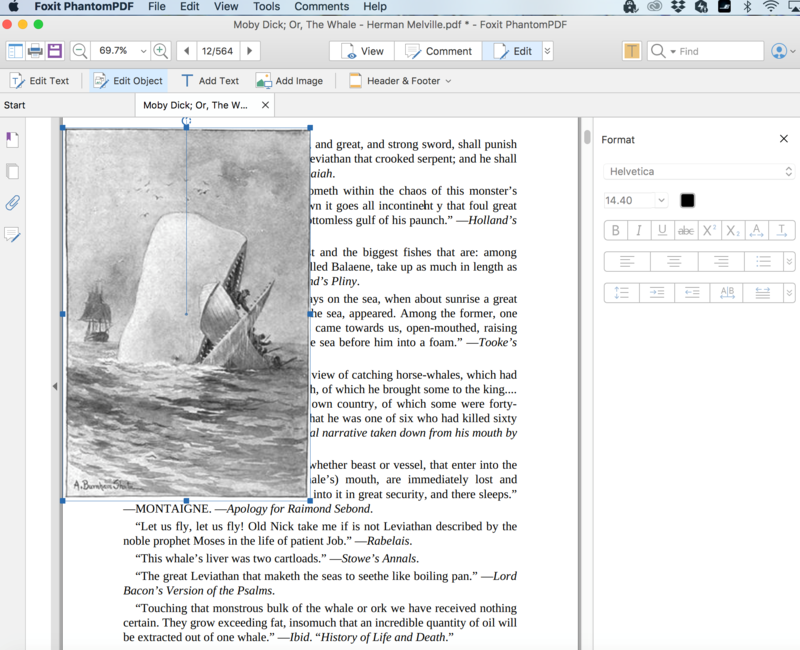 With PhantomPDF Mac, you can add, remove, and move images to your heart’s content. Here’s how to take image editing in PDF files to the next level. Locate the page where you want to add the image. Select Add Image in the Edit toolbar. Select the image file in the pop-up dialog box, and click Open. The selected image will be added as an object in the PDF file. To resize or move it, if necessary, just click it and refer to Resize, Move, or Rotate Objects for more information. Drag any of the small rectangles shown on the border of the box to resize the image object. Hold on the Rotate icon and drag the cursor to rotate the image object. Drag the image object to move it to a desired place. Right-click the image object, and choose an option from the context menu to cut, copy, paste, or delete the image object. As you can see, adding and editing text and images in Foxit PhantomPDF Mac is as easy as doing it in your standard Mac-based publishing software. Try it yourself. Thanks for the review of the editor. I have macbook, and I on it write every day articles and term papers for students. I looked for the good editor for pdf files. I wnt to try it on my mac. I am ready to buy Foxit but I have one question … if I “buy” Foxit, can I share it among my other computers and phone? Hi Danny , if you buy Foxit PhantomPDF Business you can use it one PC. You can download Foxit mobile which is free on your phone and you can use connected PDF (included on PhantomPDF Business ) to share your documents on your mobile and PC .